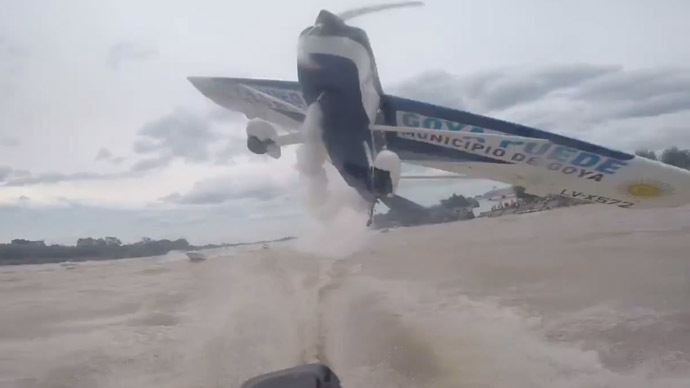 A footage that will definitely send shivers down your spine: watch how a low-flying aircraft almost smashes into a fishermen’s boat. The fishermen are in their speedboat during a local fishing festival, at Fiesta del Surubi, in Goya, Argentina. Suddenly, wham! A plane appears only meters away from what might have been a bloody, fatal crash, when it dropped to sea level. In the background, the fishermen are heard screaming in horror – but, luckily, the aircraft misses the three and their vessel by mere inches. The blood-chilling footage was filmed by a camera onboard the boat.